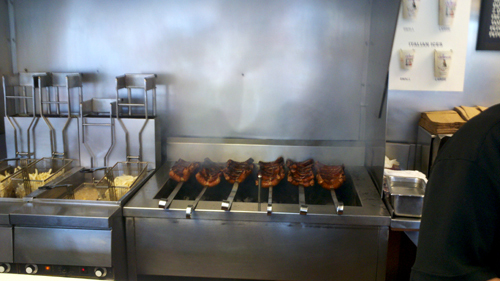 Having just had a dog at Gene’s and Jude’s (it was so hard to limit the chowing to one) we headed to Johnnie’s Charcoal. This is a place that has never made the food network or any other press that I have ever seen. Another reason to torture family and friends when on culinary excursions, they often have new unheard of spots that will make your trip. Johnnie’s is one of those. Also on the west side of the city, Johnnie’s isn’t any prettier than G&J’s but it is definitely more recent. We met a guy from Michigan in the parking lot who had been waiting for some time to get into the place. There are a few outdoor picnic tables and a counter for standing up/chowing down is right across from the service counter with about a 3 foot clearance for all involved. What really makes this place stand apart is the second you walk in the door you can smell the sausages crackling over a charcoal fired pit right behind the line. Not sure exactly how they get away with that, must have spent a fortune on ventilation. 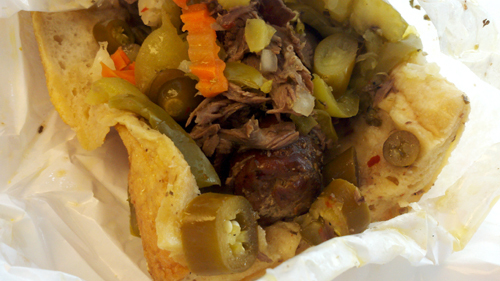 Sitting on spits are links of a very aggressive sausage and we ordered a couple of combos…sausage and Italian beef topped with a very peppery veggie blend. Stunning, there honestly aren’t words that would suffice for this combination of sausage and beef all juicy and loaded up with heady and spicy pepper. 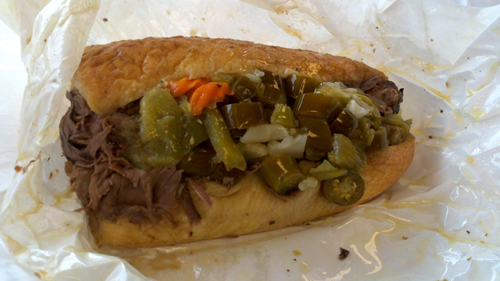 Just going to say it…even with Mr. Beef’s and Al's Beef this was the best Italian beef we had in Chicago. 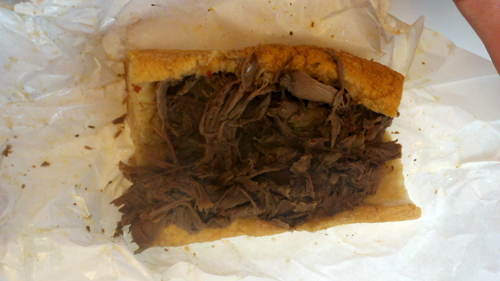 I had a bite of the beef Sammy without the sausage and all the fixin’s and it has a peppery spiciness all its own. You would think that the bread would not be able to withstand the juicy onslaught of the stuff packed inside but rumor has it that Johnnie’s uses the local bakery’s Gonnellae rolls which manage to restrain what would absolutely destroy any average chunk o’ bread. 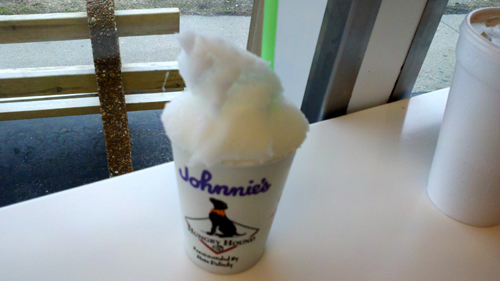 The other thing on the menu was an Italian Ice. Lemon. If it were hot and muggy outside this would have been pure unadulterated heaven. Cold and overcast it was just excellent. The crystals of ice are so small that each spoonful has a perfectly smooth texture. Smooth until you run into the slices of lemon that have taken up a flavor lending residence in the concoction. Light, fresh, slightly sweet and with a pronounced but balanced lemon flavor; the ice was an ideal complement and finish to a superior but simple meal. It would be a shame to have stuck to locations ordained by the press in Chicago…a trip off the beaten path to Johnnie’s resulted in a meaty enlightenment. If you can find it…STOP…ORDER…EAT…and like the shampoo directions say…you will repeat. If you are looking for more pizzazz and options, and a little comfort, Al's will welcome you. 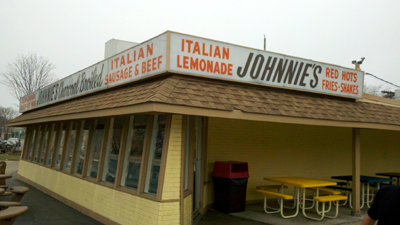 If you want to go to the place most haven’t heard of but to me has the most outstanding sandwich and flavor, try Johnnies.